What Learning To Ride A Bike Taught Me About Life – Let's Make Content together! My parents wanted me to learn how to ride a bike. Not because it is an oh so essential life skill that I can’t do without, rather, they wanted me to overcome my fear. I made excuses at first. Tried to not look at the bike because I thought that will make my parents realize how much I didn’t want to learn how to ride one. But that’s not how life works. Sometimes you just have to do things that you don’t want to do and sometimes you are made to. 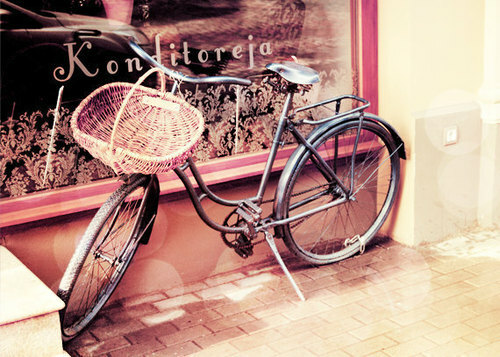 It was a hot summer day, I had just come back from school and my mum was waiting outside our apartment with THE bike. I looked at my mum and said, ‘Nice! are you going for a ride?’ She gave me the death stare and replied, ‘No…but we are.’, in a tone that let me know that she meant business. I wish I could say, I got on to that bike and rode away into oblivion and everything was fine and dandy… except, it wasn’t. We slowwwwwlllyyyyy (like a pair of tortoises) made our way to the neighbourhood basketball court. Oh that damned basketball court, I still remember it. I tried to resist it as much as possible. Tried to cry, tried to reason with my mother but she wouldn’t have any of it! She was hell bent on making me learn how to ride one and she did. I was not even allowed to drink water till I learnt how to ride one. Before the day came to an end, I knew how to maintain my balance on a bicycle! Sure I didn’t know how to turn corners but you know what they say, practice makes perfect! Long story short, there are going to be a lot of things in your life that you are going to be afraid of. You are going to resist them, hate them, try to make up excuses for not wanting to do them. But you know what’s easier? Learning to master it, learning to master your fears. Is there something that you have always been wanting to or meaning to do but never got the chance to because it scared you practically sh*tless? You know when will be a good time to do them? Take the leap and fake it till you make it. OMG! This is such a perfect piece you wrote! I wish I could “like” it a hundred times, that’s how good it is. Plus, it’s true! Sometimes you can take little baby steps to master a fear, and other times a fear can be mastered in one big giant leap. But the key is to find YOUR WAY of mastering the fear so that the fear doesn’t master you. Thank you Darlene! I am not quite there yet but I am getting there! 🙂 You are awesome! I am going to send you an email right about now! 🙂 I am glad I was able to do that! Stay awesome! My favorite post so far, you’ve hit a nerve we all can relate to, and hopefully gave us the courage to just do it. My daughter has coordination and other health issues, so she is still not riding a bike, and I fear for her sometimes. As for me, I’m scared about the next step writing wise, because deep down I know this just might go somewhere. Weird, I know! All the best Julie! You write wonderful posts! Oh I hope your daughter will learn to ride one soon and that she will overcome all her fears and health issues 🙂 Much love to you! Go ahead and do them! No time like now! This was beautiful. Stunning, in fact. I learnt when I was about 6, one of my neighbours taught me how to do it. 🙂 I’ve always wanted to learn how to ride a motor bike but I can’t bring myself to do it. My dad had a Harley nearly a decade ago and he came off of that and broke several bones in his body. Screw that, I’ll stick to driving dangerously. I tried riding a motor bike when I was 15, I flew off of the back of it haha. Dear keyboard on fire, this was a great post. Thanks for sharing your terrifying moments with us. Well done! you must have loved it so much, that you commented twice eh? 😉 Thank you! I wish I’m as brave. Hey, Ria. New site, huh. Love it!! You could “riding a bike” with “doing drugs” and you’d have my life story. Seriously though, this is a great story about going for it. Legitimately good advice. I conquered the same sort of fear when it came to running. Growing up I was not an athletic person- definitely more the intellectual-artistic type. Through university however I really wished I could take a break from all the stress of exams and papers and, literally, run free. My big hang-up? Having someone see me start running and….. 100 feet down the road, see me stop again. But I worked at it and now I run 5k every (k, bit of an exaggeration…) day. Fear conquered. Now I feel the benefits, like health, confidence, stress-relief and goal setting, ripple into other areas of my life. Running is awesome! Glad that you conquered your fear! 😀 Keep going! Maybe one day I’ll finally feel like I’ve gotten enough done to be at peace. Best of luck with the new blog! I’m starting two more blogs myself soon 😉 YIKES!!! haha really? why did they forbid you to ride one? I wish my parents had done that 😉 I have a phobia of losing my balance. Really? I want links lovely lady! 😀 I can’t wait to read them! I saw your cover photo and fell in love. Read this post and almost teared. Where is the subscribe button? Viewing it via my iPhone now.